The What: DPI has launched the E-Vision Laser 8500 Laser, which delivers 8,500 lumens from a stable, solid-state light source, capable of producing over 20,000 hours of illumination. 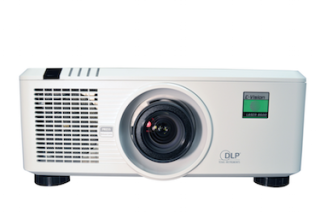 The What Else: The single chip projector was developed with a “Fit and Forget” directive, and thus was designed to need minimal maintenance throughout the lifetime of the display. The Bottom Line: The solid state illumination system eliminates the need to periodically replace the light lamp. By bypassing regular lamp replacement cycles, most costs related to the E-Vision Laser are incurred at time of purchase. This characteristic purportedly lowers much of the cost of ownership over the lifespan of the display.